Dutchess is an 11 year old, spayed female Great Dane that was evaluated for hind limb weakness and ataxia. She was evaluated and treated with acupuncture, laser and at home massage therapy for a total of five treatments during a 10 week period. Though she battles normal aging as well as a degenerative process, Dutchess and her owner are much happier about her improved quality of life, increased mobility and playfulness, improved appetite and she seems more interested in interacting with other dogs and her owners. They plan to continue with routine acupuncture and laser treatments. Dutchess, an 11 year old, spayed female, Great Dane is owned by a veterinary technician. She was adopted at the age of 10. Prior to this owner, she had 4 different owners, and was adopted at a garage sale so her previous history is not well known. We know that she has severe arthritis and a stiff gait. She takes 100 mg carprofen twice daily and 500 mg gabapentin twice daily. A few months prior to my exam, Dutch had gotten attacked by a dog at the dog park and has been dragging her hind limbs more significantly since. The puncture wounds were near the paraspinal muscles of T9-T10 and L1-L3. She also has a known right front flexor tendon tear of unknown duration. Her toenail at P5 on the left hind is recently torn/injured. She eats, but often takes coaxing and tends to get bored with the same food. Her bowel movements are good and controlled. No other complaints. Physical exam showed bilateral immature ocular cataracts, dental tartar with normal heart and lung auscultation. Her abdomen was unremarkable with no masses, pain or fluid wave appreciated. Evaluation of musculoskeletal and neurological systems showed a body condition score of 5/9. She has crossed extension both hind limbs and a positive crossed extension with the left front. She is tender to touch at BL 10 bilaterally, all along the cervical muscles, and has tight, ropy bands along her lumbar spine. There is myofascial adhesions/skin tightness along her neck and thoracic inlet and lateral thighs. She had trigger points within her infraspinatus and supraspinatus muscles bilaterally. She has mild atrophy of her thigh muscles (quads and hamstrings/semimembranosis and semitendinosus). Her gait is asynchronous, irregular ataxia. When she is walking, her hind limbs (especially the left hind) fall and drag, but at a run (difficult to capture on video), her front limbs are hypermetric. – Spastic gait. She has delayed CP in both hind limbs, but more severe in left hind. She does not like to be led by her collar and she has more difficulties turning her neck to the left than the right. She resists neck extension dorsally as well. She resists much evaluation distal to the elbows and stifles. Especially on her left hind foot, this has a broken toenail on digit number 5. Rule outs include: The likely primary lesion is localized to neck (with crossed extension to the left front and hind limbs, indicating UMN) but cannot r/o a smaller lesion around the recent dog bite wounds/lower spine (traumatic) as well (still UMN to hind limbs). Osteoarthritis (inflammatory); Wobblers/cervical spinal lesions (congenital, degenerative, secondary to collar); other type of upper motor neuron lesion (vascular, neoplastic, degenerative, traumatic, granulomatous, disc material). There is also history of the right front flexor tendons that could cause subsequent muscular imbalances, resulting in spinal/peripheral nerve imbalances as well. Injury to the right front flexor tendon has likely caused neuromuscular imbalances. Unsure if this has caused the Wobbler’s like lesion or if this is in addition to. Not knowing her history or leash/collar training in the past, it is difficult to determine if previous neck injuries or chronic disuse. There are osteoarthritic changes in other joints, and though we do not have radiographs to check the cervical facets, the chances are likely. Putting this information together with the exam, more specifically, crossed extension positive on left front and both hind limbs, a cervical lesion is highly suspicious. Based on history, physical exam and putative diagnosis, would like to treat the cervical spinal segments and improve neuromuscular control to the caudal nerve fibers (such as hind limbs). Would like to attempt at pain relief in the front right limb (flexor tendon injury- with goals to relax the extensors and strengthen the flexors). This will include working the opposite limb to relieve muscle imbalances and relieve muscle tension. I would like to help the nervous system to communicate better with the hind limbs as well. In order to do this, I will use the following techniques to cover the central, peripheral, autonomic and myofascial approach(es). Between acupuncture appointments, her owner performed massage to all the areas we discussed at the exam, that were tight and sore. This was her first acupuncture treatment and so we went tested the waters. We used 0.16 mm x 30 mm Seirin needles. She tolerated most of the needling well this treatment. Points used were: GV 14, GV 20, Bai Hui, Cervical trigger points, Bilateral: BL 25, BL 27, BL 28, BL 23, BL 22, BL 21, GB 21, BL 54, GB 29, GB 30, SI 10, SI 11. Left: GB 31, Ba Feng, Right LI 11. Attempted ST 36, but was too sensitive, we massaged the point instead. The needles were left in place approximately 15 minutes. Second & third treatments included acupuncture and e-stim. We used a combination of Carbo 0.2 mm x 25 mm needles, 0.2 mm x 30 mm Seirin and 0.16 mm x 30 mm Seirin needles. We used the Carbos in areas where the needles tended to want to back out at the last treatment, we used 0.2 mm diameter for better e-stim and 0.16 mm needles in the tender and more reactive areas, such as Ba Feng and ST 36. Points for this treatment were based upon previous exam/diagnosis as well as a new myofascial evaluation: GV 14, GV 20, Bai Hui, Cervical trigger points, Bilateral: BL10, BL 25, BL 23, GB 21, BL 54, GB 29, GB 30, SI 10, SI 11. Left: GB 31, Ba Feng. ST 36 was bilaterally successful this treatment. The needles were left in place approximately 20 minutes during these sessions. E-stim was performed using an ETO unit from GB 29 to GB31and from BL 23 to BL 25 bilaterally at 20 Hz for 3 minutes, then 100 Hz for 3 minutes. The same acupuncture points were used as above, for approximately 20 minutes. The same e-stim as above, however, we only performed on the left sides as this continued to be her weaker side. Laser was used at these final two appointments: A K-Laser Platinum machine was used, but we did not use the pre-sets. We used a custom treatment and targeted the caudal cervical spinal facets and the left pez. We used 3 watts at 810 nm for 3 minutes then 3 watts at 980 nm for 2 minutes on the cervical region. Then for the pez, 2 watts at 650 nm for 3 minutes then 2 watts at 810 nm for 3 minutes. Dutchess showed noticeable difference immediately after her first acupuncture treatment, and after every treatment. 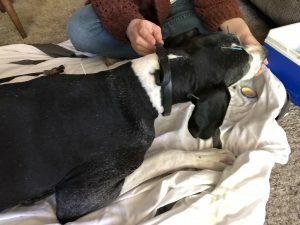 Her owner did not notice any adverse effects.Her hind limb dragging, overall, significantly improved, she was up and “playing like a puppy” the next morning according to her owner, when she usually lies in bed until she hears the food in the bowl. Her owner reports that she is more interactive, she seeks attention instead of sleeping all day. She holds her head more upright and perks her ears forward. She required less coaxing to eat her food. 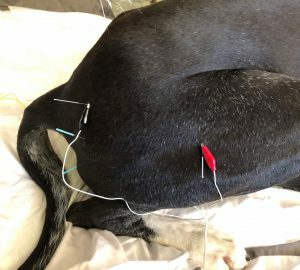 Her symptoms slowly start to return after about 10 to 14 days and her owner is working on getting her onto a more routine acupuncture schedule every 2 weeks. This case, combined with other documented successes 1, 2 of acupuncture and electroacupuncture in “Wobbler Syndrome,” brings promising alternatives to pharmaceutical options and possibly even longer longevity due to improved mobility and quality of life, especially in geriatric forms when the symptoms are related to a degenerative process as opposed to a congenital process. As stated in Xie’s publishing2, it may even offer alternatives to surgery. It would be interesting to follow more of these cases for reduced need for pain medications. 1) Sumano H1, Bermudez E, Obregon K. Treatment of wobbler syndrome in dogs with electroacupuncture. Dtsch Tierarztl Wochenschr. 2000 Jun;107(6):231-5. 3) Robinson, Narda G. Interactive Medical Acupuncture Anatomy. 1st ed. Teton NewMedia. 2015. Dutchess taught me that alternating therapies can show promising results and may stimulate the nervous system in a different way. This is a relief for a new practitioner to know that there should not be just one “formula” you go to for certain diagnoses. It is important to evaluated the patient as a whole, and at least briefly at each visit to check for new injuries or new imbalances that show up. This is especially important for the more chronic and geriatric cases that may have several problems that have accumulated over time.